Brain tumors cause damage because, as they grow, they can interfere with surrounding cells that serve vital roles in our everyday life. Most brain and spinal cord tumors have no known risk factors and occur for no apparent reason. There are no known proven ways to prevent these tumors. Various types of brain tumors exist; however, according to John Hopkins Medicine, meningioma is the most common type of brain tumor. More than 40,000 Americans will be diagnosed with a primary brain tumor this year. The chance of developing a malignant brain or spinal cord tumor is less than 1%. Approximately 80% of brain tumors are benign and non-cancerous. Nearly 17,000 people will die from a brain or spinal tumor this year. No blood test or other screening exam can detect brain tumors, but there are often some outward signs. Tumors in different parts of the central nervous system disrupt different functions. Tingling and/or stiffness focused on one side of the body is one symptom of brain tumors. Seizures, which are a sudden convulsion due to an unusual burst of electricity in a person’s brain, are also a symptoms of brain tumors. Signs of a seizure include unconsciousness, staring and muscle contractions. If studies or scans indicate you might have a brain tumor, some tissue may be taken from the tumor to make an exact diagnosis. This test is called a biopsy. A spinal tap may also be performed to look for tumor cells. During this test, a needle is placed in the lower back to obtain a sample of cerebrospinal fluid. This fluid is then examined to see if tumor cells are present. Radiation therapy works within tumor cells by damaging their ability to multiply. When these cells die, the body naturally eliminates them. Healthy cells near the tumor may be affected by radiation, but they are able to repair themselves in a way tumor cells cannot. SERO is home to 20 cancer treatment centers with locations in Charlotte, NC and surrounding areas. We are proud to serve the entire Southeast region of the United States. Internal radiation therapy, or brachytherapy, works by placing radioactive sources in or just next to a tumor. During brachytherapy, a tube or balloon called a catheter will be inserted into the brain. The radiation will then be carried to the tumor using this catheter. GliaSite™ is an example of a balloon cathether device used in this procedure. The radioactive source will then be left in place from several hours to several days to kill the tumor cells. 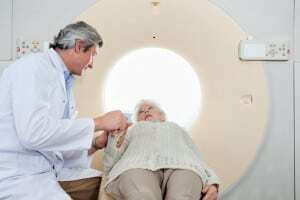 In some cases, the radiation is permanently placed directly into the tumor or the area where the tumor was before surgery. Doctors are constantly exploring newer and better ways to treat primary brain tumors. Drugs that make tumor cells more sensitive to radiation are called radiosensitizers. Combining radiation with radiosensitizers may allow doctors to kill more tumor cells. Chemotherapy is used with radiation to treat some brain tumors. Your doctor may recommend that you consult with a medical oncologist (chemotherapy doctor) before starting radiation. The effects of brain radiation can vary depending on your tumor and the technique used to treat it. Before treatment, your radiation oncologist will discuss any side effects – however rare – you may experience. Possible side effects can include fatigue, change in appetite, headaches, visual changes, hair loss, skin irritation, nausea, vomiting and/or unsteadiness. Some side effects can be treated with steroids or other medications. Talk to your doctor about any problems you experience.